Colin Pantall's blog: Congratulations Andy Stanton! Imagine my surprise to hear Andy Stanton, my favourite children's author being interviewed by John Humphrys on The Today programme (listen here). The occasion? To celebrate the award of the Roald Dahl Funny Prize for Andy's fabulous Mr Gum and the Dancing Bear. As Andy says, "Mr Gum and the Dancing Bear is about Mr Gum and a Dancing Bear." How does he write a funny book for children. First he tries not to think about children too much, "...then I picture my contractual obligations, then I look out the window, then I phone my mum and say I can't write, I can't think of anything, then I drink too much coffee, then I write something." and imagine MY surprise to be ON that show. what a world it all is, i tells ya. what a world. 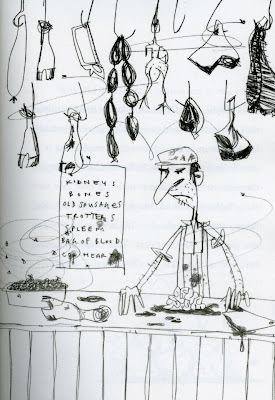 He draws great flies. They remind me of the way Big Daddy Ed Roth would draw them. Great everything, Darrell and a great moral story that depicts the fight between good and evil as well as the ravaged psyche of the author - phds will be written on this. The analysis starts here. Hi Andy: That's what we pay our license fee for. First Dizzee Rascal and now you. it's got to be good.